I had high praise for last year’s Superior Carnage miniseries, but I remember thinking it ended on a bit of flat note in how it essentially reinstalled Carnage/Cletus Kasady’s same-old played-out status quo. 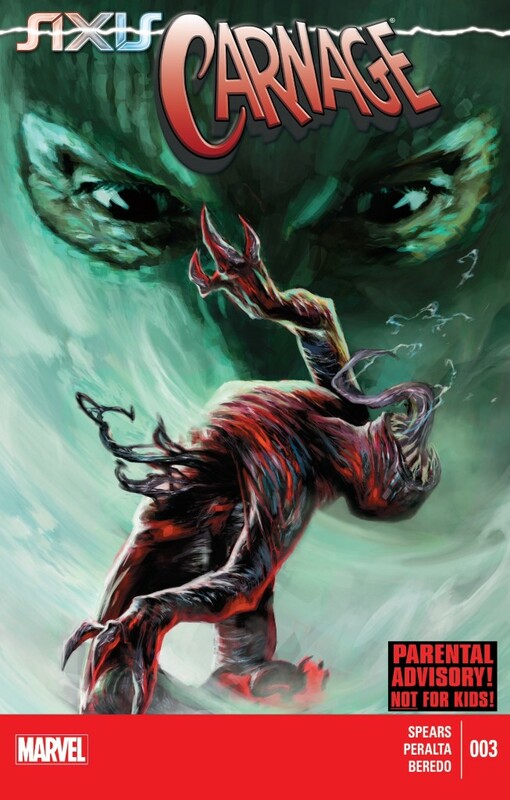 So when approching the final chapter of the Rick Spears/German Peralta Axis: Carnage mini – another comic I found myself liking despite my overall distaste for all things Carnage – I tempered my expectations quite a bit. 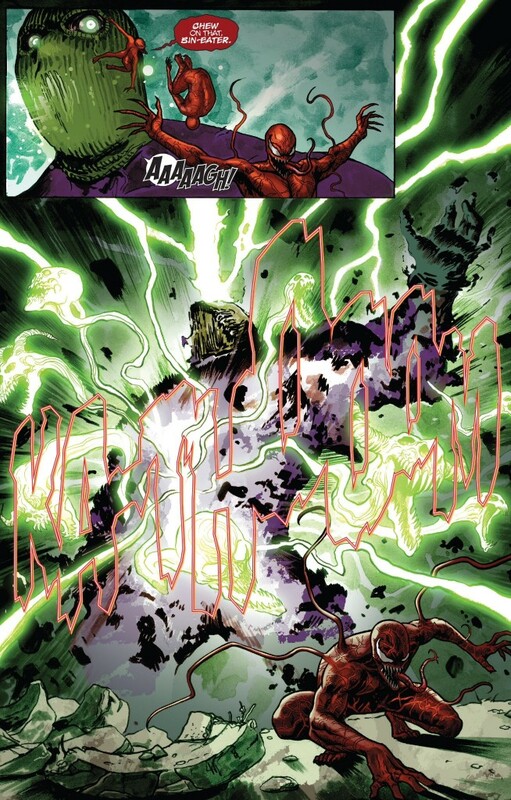 It’s not like anyone is really expecting Marvel to continue this charade of Cletus trying to act a hero, all thanks to this mystical “Inversion” spell that has everybody acting maddeningly out character (which has made the main Avengers/X-Men: Axis series into an incomprehensible mess filled with ridiculous retcons and horrendous character moments). But Spears and Peralta seem to have stuck the landing when it comes to Axis: Carnage #3. It’s not a perfect comic by any stretch, and some of the final pages seem to go a bit over-the-top with how certain turns of character are depicted, but the actual arc of Cletus himself has placed the mass-murdering sociopath at a bit of crossroads, which could potentially lead to some interesting things for Carnage down the road if Spears or some other writer wants to take a stab at writing him. I prefer the ambiguity of Spears’s ending to the harder reset we got in Superior Carnage. There’s still a very good chance that the next creative team that writes a Carnage book will make Cletus a bloodthirsty villain again, but there’s enough wiggle room that maybe, just maybe, Kasady could emerge as a Venom-esque anti-hero (back when it was cool for Venom to an anti-hero). 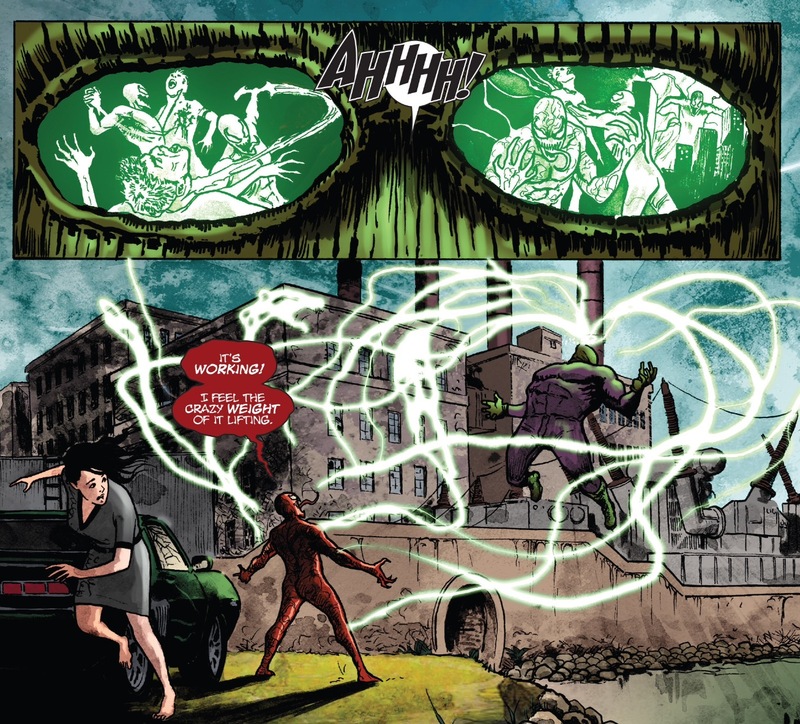 Similar to the previous issue of this series, Axis: Carnage #3 kicks off with another hilarious Cletus childhood flashback/vision where Kadady’s lesson is something to the tune of “with great power comes …. Something.” These Kasady childhood sequences are some of the most clever comic book visuals I’ve seen this year – I especially love how Peralta makes young Kasady look almost ghoulish in how he costumes the character with a red unitard and a Carnage Halloween (ish) mask. In the present day, Carnage is still coming to terms with the fact that regardless of how noble or selfless he acts, the world refuses to see him as anything less than psychotic villain. It appears that everyone but Cletus understands that his path to hero-dom is paved with roadblocks and open manhole covers. And yet the character continues to fight on to save television reporter Alice Gleason, despite getting struck by missiles and machinegun fire. It would actually be a pretty inspiring story if this wasn’t Carnage. Instead it’s just hilariously pitiable. The comic’s usage of the Sin-Eater left a few things to be desired. Spears and Peralta have transformed this former street level nightmare (courtesy of Peter David) into a demonic soul sucker on the level of someone like Dormammu. And while this new characterization produced a funny punchline – Sin-Eater basically overloads from the amount of sin Cletus has committed – I think it would have been better served if the creative team had just developed a new demon-like character for this series rather than reboot the actual Sin-Eater. Part of what made the “Death of Jean Dewolff” such a riveting read was the fact that Stan Carter as the Sin-Eater could have been any lunatic in a ski mask carrying a shotgun. How such a seemingly normal person could be that evil was absolutely terrifying. The Axis: Carnage version of the character falls short in creating that layer of relateable terror. Alice’s turn at the end of this comic was also a tad to over-the-top for my tastes. Spears and Peralata have already gone out of their way to establish that she’s not a very nice person who probably doesn’t deserve to be saved – even by a former villain like Carnage. But to have her respond to Carnage’s heroics by attempting to blow him up felt more like a serving story over character moment. 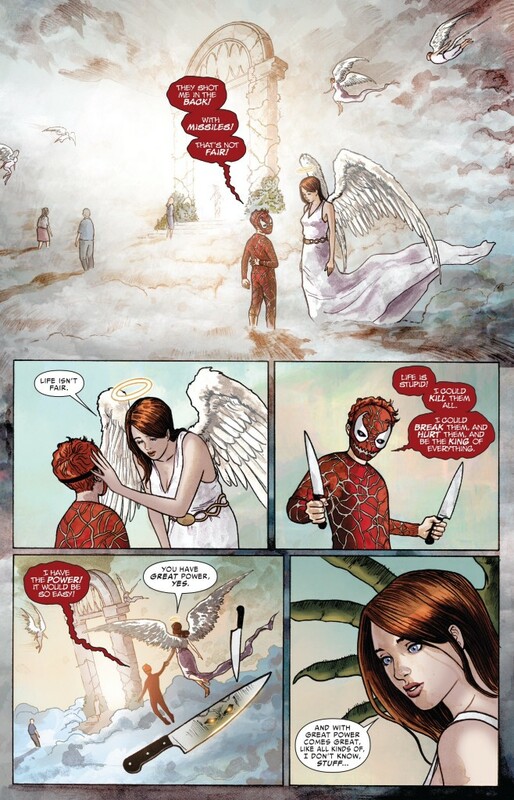 Spears needed to get his script to a point where Carnage felt he was better off alone, but I think there were probably more logical, less absurd ways of doing that than having the damsel in distress try to murder her savior – even if that savior is a murderer himself. Still, this book is at its best when the focus is squarely on Carnage – something I haven’t said about a series starring this character in … forever. Spears has a great grasp of what makes this new “inverted” version of the character tick and deserves an opportunity to write a few more adventures starring Kasady. Hopefully this is something that’s in the cards come 2015.